High school students register through their home school counseling offices and receive priority through pre-registration for classes that meet from 12:45- 3:45 and 3:45 - 6:45 p.m. High school students must reside within the geographical area of the seven school districts served by SoCal ROC or attend a school specifically authorized by the Superintendent and/or Board of Education. High school students do not pay fees. Registration procedures may vary from semester to semester and are subject to change without prior notice. 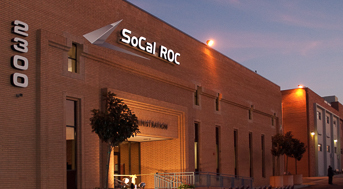 Adult students must come into the SoCal ROC Office in order to register for classes. A fee is required for each class. Fees range from $250 - $4,500 depending on the class. There is a $25 registration fee that is non-refundable. Additional cost can be required for books, uniforms, and/or material. Courses are offered year-round, and some have various enrollment points throughout the year. Evening classes meet 6:45 p.m.-9:45 p.m. or adults may take advantage of the 12:45 p.m.- 3:45 p.m. and 3:45 - 6:45 p.m.
You may register for a course by coming in to the Center located at 2300 Crenshaw Blvd., Torrance, CA, 90501 (310) 224-4200. For assistance with CalWorks information, call LaTanya Jones, Special Projects Coordinator (310) 224-4225. Monday - Thursday 7:30 a.m. to 7:30 p.m. Course Outlines: What is a Course Outline? The course outline is simply the list of the course modules. It is similar to a table of contents in a book or the outline used for writing papers. The outline defines the scope and content of your course. The outline is closely linked with the goals and objectives. Course Learning Objectives are clear, concise, and measurable describing performance, conditions, and standards. Teachers take the course outline and build a course syllabus which lets the student know important information about the course such as what the course is about, grading, requirements, meeting dates and times, contact information, information about course text, recommended readings, and course assignments. CTE standards: What are the CTE Standards? The California Career Technical Education Model Curriculum Standards were adopted by the State Board of Education on May 11, 2005 and are now available from the California Department of Education. The standards, written for grades 7-12, specify learning goals in 58 career pathways organized around 15 industry sectors. The CTE Framework is designed to guide curriculum discussions at the local level resulting in a rigorous and relevant career technical education curriculum that increases student achievement. The CTE standards and framework will bolster California's standards-based education system by incorporating cutting-edge knowledge about career options, technology, and skills required for success in adult life. This initiative is critical if California is to meet the challenges inherent in its diverse, rapidly changing education, economic, policy, and workforce environment.